There is a unique magic during Christmas on Capri and the Amalfi Coast. 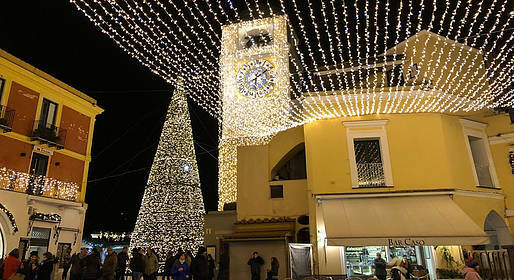 You won't find snow or arctic temperatures, but the beauty of the season is in the coastal villages decorated with fairy lights, the scent of traditional zeppole and struffoli fried sweets in the air, and the shops filled with goodies for the season. If you are looking for a New Year's destination, ring in the coming year in Capri's Piazzetta, the most glamorous and trendy spot in the area! Sorrento is famous for its Christmas decorations, from the towering musical tree in Piazza Tasso to the Disney character village in the nearby park. Even the pretty lights in the tiny coastal villages like Atrani and Positano are charming, and make the town seem like living Nativity scenes. On clear winter days, take the ferry across to Capri and spend the day exploring the quiet island, being sure to stop in the Piazzetta lit with holiday lights. In our article on winter on Capri, you can find all the logistical information you need to plan a winter trip to Capri.